Anna’s take: I was going to order a burger at Bar Louie, but burgers seem to have become one of my main food staples lately. I figured I should try something different, so I ordered the Voodoo Pasta. 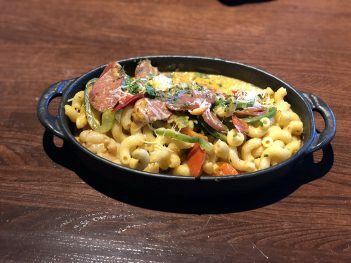 This is a creamy blend of cavatappi pasta, jumbo shrimp, andouille sausage and red and green bell peppers mixed with a house-made voodoo sauce. It’s not overly spicy, but it has a nice burn to it. The only thing I would add is more shrimp, but I get a bit greedy when it comes to seafood. The plentiful andouille sausage made up for it. Suggested pairings: I’ve been on a bourbon kick lately, so I ordered Bar Louie’s New Old Fashioned, which is crafted with Bulleit Rye, angostura bitters, pure cane syrup and topped with a maraschino cherry and an orange twist.